In each problem below you will find a group of four numbers or expressions. Three of the numbers belong to the same family. The other number is trying to fool you into thinking he/she belongs with the other three by wearing a disguise. Pick out the number or expression and explain why that number doesn’t belong to the family. 1. Cross out the number or expression that doesn’t belong to the family and explain why. 2. Circle the number or expression that doesn’t belong to the family and explain why. 3. Circle the number or expression that doesn’t belong to the family and explain why. 4. Circle the number or expression that doesn’t belong to the family and explain why. Teacher Notes: In each example above there is one value that is not the same as the other three. You need to pick that one out. However, they’re maybe some differences of opinion as to which one does not belong. This leads to a good discussion that may lead to a contrary answer. In his book, Which One Doesn’t Belong? 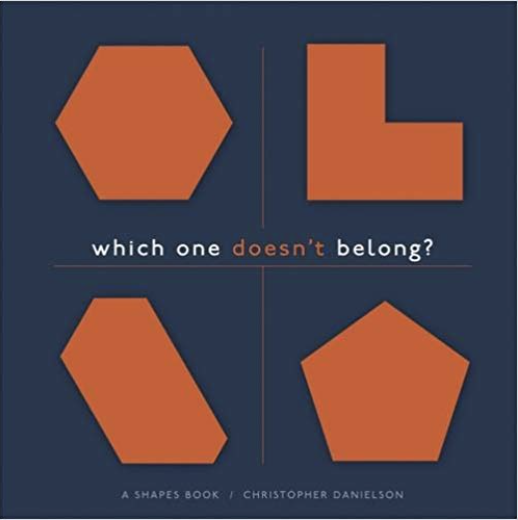 Christopher Danielson wants the student’s to come up with different answers since every choice can be correct with an appropriate explanation. See his explanation via video here.